The electric powered bike has been in existence since 1881, with the Trouvé Tricycle. However, it was not until 1995 that the modern electric bike era came into being. Around this time, there was a confluence of several technologies: the pedal assist system, neodynium magnets and lightweight Lithium-ion batteries. For more than 20 years, different manufacturers have released their own e-bikes with proprietary designs based on evolutionary ideas at different price points. The Copenhagen Wheel is one of the few revolutionary concepts for an e-bike. The Copenhagen Wheel is simply a wheel. It is not a bike per se, but it turns almost any bike into an E-bike by simply replacing the rear wheel. It contains a battery, motor, sensors and a computer. The pedal-assist drive mechanism helps the rider to pedal faster, or with more power, when needed. 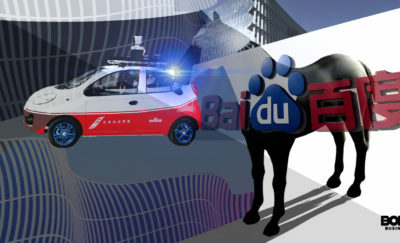 Described as a semi-autonomous robot, it is able to read the rider’s intention and assist him by boosting power when needed. The CEO and founder of Superpedestrian, Assaf Biderman, likens it to making the rider “feel naturally stronger.” The controls are sent via Bluetooth to an app on the smartphone, which is placed on a holder and stand nestling on the bike’s handlebars. Besides controlling the Wheel, the app also records and monitors distance, duration, speed of each trip. The control allows the user to choose the assistance “level” off, standard, eco, turbo or exercise. Default mode is “standard”. If the rider needs an extra boost, he chooses “turbo”. For more economical use of energy and less power, “eco” is chosen. The “exercise” mode provides the rider some workout, with the wheel adding resistance to the pedaling, and the harder the rider pedals, the stronger the resistance. 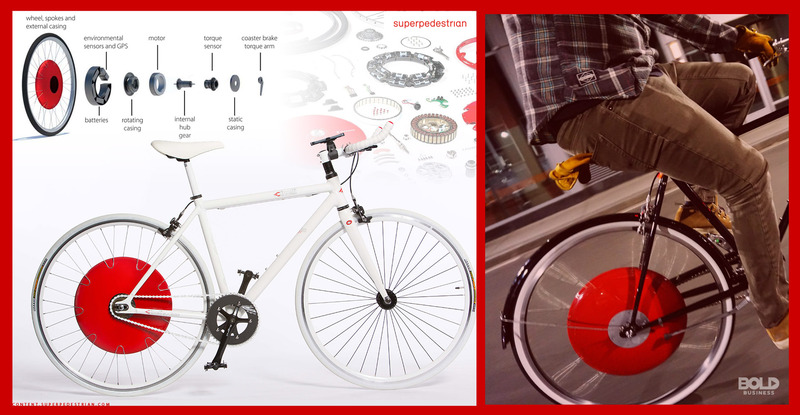 The Copenhagen Wheel converts an ordinary bike into an electric hybrid. The wheel swap can be done in minutes and after registering the smartphone app, the user is ready to go. It also serves as a personal trainer, it senses the effort put into pedaling and adds power on its own. It does not have a throttle to control the power. Instead it relies on the user pedaling. When the pedaling starts, the motor kicks in and helps with the pedal. It is intuitive enough to know when additional power is put on the pedal, especially when riding uphill, and more power is pumped into the motor. The added power is not a jolt but more of a gentle nudge and push. It is an assistive riding experience. When the rider stops pedaling the motor cuts out as well. The Copenhagen Wheel had its beginnings at the Senseable City Lab at MIT in 2009. The spin off became the startup named Superpedestrian and based in Cambridge, MA. The initial orders were taken in 2013, but full delivery to all the backers was fulfilled in March of 2017. By May, its production capacity was able to deliver Copenhagen Wheels within two to three weeks. The actual wheel itself is a red, frisbee-sized axle for the rear wheel. This serves as the housing for the electronics, and mechanical parts. It has a range of 31 miles, and mileage will vary. On eco mode, it will last longer, up to 40 miles. Tackling hills, going against the wind, carrying more weight, as well as running on turbo will shorten the range. Most pedal assist bikes have the motor powering the wheel when it is needed. 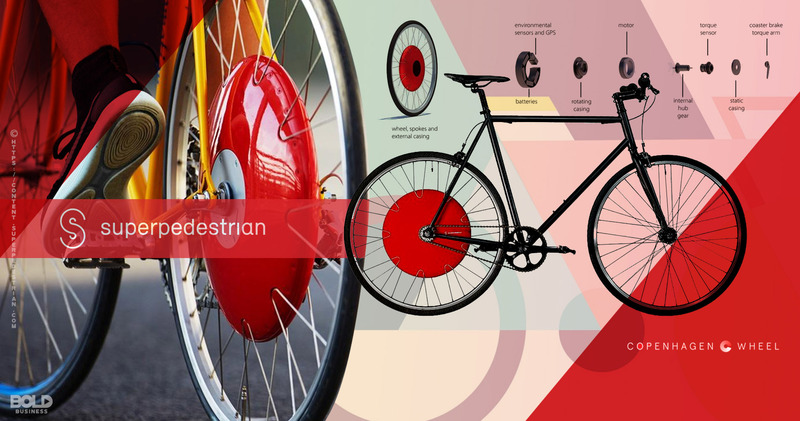 The Copenhagen Wheel also enables the rider to send power back to the battery via backpedaling. The recharging is done by backpedaling. This slows down the E-bike, but does not halt it completely. For sudden brakes, or better deceleration, the brakes have to be used. This is almost the same technology – kinetic energy recovery system – used in Formula 1 cars and other hybrids. Although this cannot fully charge the battery, it does help prolong the battery life. The price of the Copenhagen Wheel with the bike included is $2,000. However the Wheel can be bought separately and installed by the buyer on his own, and costs only $1,500. This may seem like a steep price, but it is still within the price range of affordable quality e-bikes. If you already have a frame, or half a bike, you can opt to buy the wheel only, and install it without any problem. There are only a few things to consider before replacing the rear wheel. The Copenhagen Wheel cannot be swapped with some bike sizes, and hence, cannot be swapped with them due to the length of the frame. In addition, it does not work with rear disk brakes. For the complete bike and Copenhagen Wheel, there are 18 different frames to choose from. The Copenhagen Wheel and all its components: the frisbee-like cover, motor, batteries and computer weighs about 17 pounds. A complete E-bike could weigh as much as 30 pounds, so this is easily the lighter and more portable option. Having no charge on the battery will result in a serious workout. The imbalance between front and rear wheels means that it cannot be hung on a quiver. There are heavier E-bikes, but it is still not a good idea to carry this E-bike into the office. The smartphone app serves as the control center for the Copenhagen Wheel. 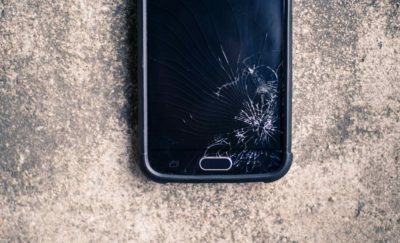 With the app, the user can lock the Wheel disabling any mobility, and preventing theft. Any thief would need to carry the bike instead of riding away with it. If the user runs out of charge on the smartphone while riding the E-bike, it has to be recharged first in order to turn off the motor. The app starts the motor, allows the rider to choose the mode and start pedaling. The app also serves as a monitoring device. It reads values for effort, distance, duration of trip, trip speed, current speed, and battery life. It can also show a graph showing how much effort was expended, and how much energy was added. It gives real-time feedback about the rider’s fitness and exercise goals, if any. This is a bike, after all, and the E-bike is meant to assist in the ride. It can also connect to other information to enhance the riding experience. This includes traffic congestion along the route, ride conditions and the area’s pollution levels. The user can keep the data in the app database. Alternatively, he can share the data with other Copenhagen Wheel users, or with friends on social media. The environmentally conscious crowd would be happy to know that the ride also counts “green miles” which is like a frequent flyer program, and is good for the environment. The Copenhagen Wheel is not a replacement for the racer or the mountain bike. It is a commute bike or a cargo bike, with a smart assistive motor system. It reads the effort of the commute and assists accordingly. It is meant to be fun, and great for the commute. It works great for city riding, and relaxed biking conditions. Overall, it is an elegant mode of transport and a great way to be mobile and physically active through the day. With all of its features and capabilities, this is a transport innovation that can make a bold impact in society in the years to come.